So having just gotten back from a couple of days of canoeing and having watched a flock of highschool teens loudly struggling with little resulting movement and control, here are a few basic tips primarily for those who would like to learn to paddle alone, but with many things transferable to tandem paddling also. And it might come in handy even then, not least if you sometimes paddle with a child that gets tired and needs to rest every now and then… Or if your partner loses the paddle or ends up overboard or more seriously catches ill, in which case you may well have to be able to paddle on your own. 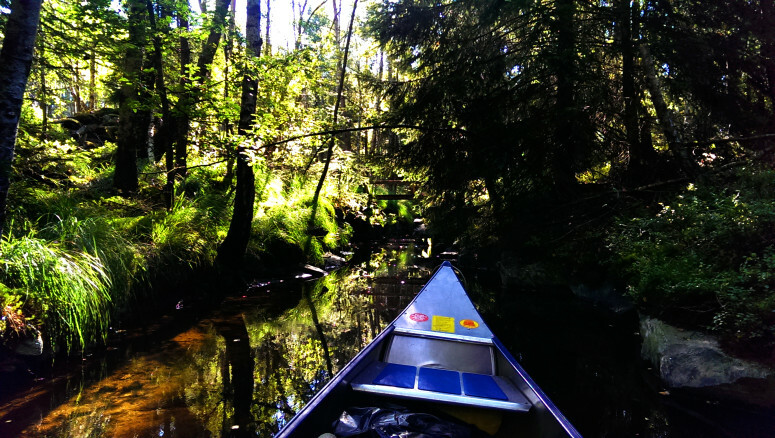 Pack so that the canoe is balanced with you and your gear in it. You don’t want one end to rise distinctly higher than the other as that will both cause problems with wind pushing the bow of the canoe to the side, as well as cause the canoe to go deeper at the other end, thus increasing the risk of getting stuck on dead trees and rocks. Make sure that the equipment doesn’t slide around in the canoe. Cover it in waterproof bags that keep them afloat in case you topple over, alternately, pack everything in your backpack in separate waterproof bags. Plastic bags is enough. Just make sure you don’t lose all your gear in case of accident. 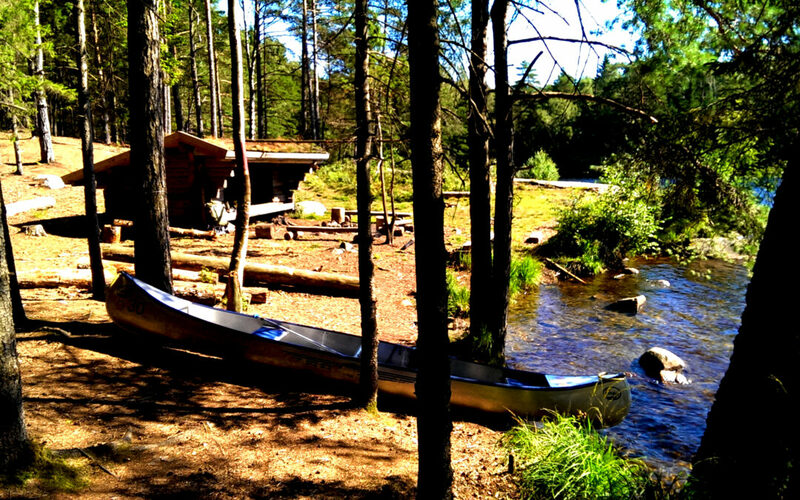 Canoes have a front and back end that shift depending on how many you are. If you are two, the back paddler should sit at the end that has the seat the closest to the stern. If you are alone, you should sit more centrally placed, meaning alone you sit at the end that the foremost person would if you were two. The canoe is more stable where it is the broadest; in the middle, so if you are getting in from the side, then that is where you get in, stepping behind the centre bar. You can also step in from the stern if you are pushing the canoe into water from land, but it can be a bit more tricky. 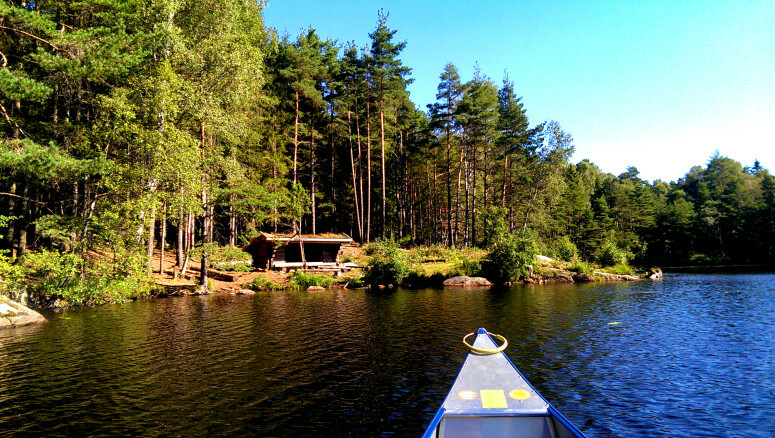 When stepping into the canoe, don’t step too far to the side since that will cause the canoe to tilt to the side more, meaning you increase the risk of falling. Step close to the keel, but make sure there is space for your other foot too. Try to grab some bush, rock or what you can find to hold on to, but don’t rely too much on it. Instead maintain your weight on the foot on land and with as low centre of mass as possible transfer the weight onto the foot in the canoe as you sit down. Same thing when you get out, only in reverse. If you need it, you can also step on the seat. Just as often the landing won’t allow you to step out by the side, and instead you have to approach straight in and get out stepping off the bow. Just stay low, leaning forward as you move. Bring your paddle with you so you can use it both to lean against for better “tripod” balance, but also to catch the canoe with if it starts drifting away once you are out of the canoe. Sitting down, it is often good to keep your feet beneath you since it changes the angle of your pelvis and straightens your back. That way you can work better for longer periods of time. Having a sleeping mat, a folded up blanket, or something similar, at the bottom of the canoe can make it more comfortable if you need to sit on your knees. Sitting centered you can use a lot more strokes that give you better control, allowing you to move sideways, and twist 360 degrees, but sitting at the stern also works well and might be the only option, depending on how you can pack your gear well balanced in the canoe. Mainly travel close to land. That way you will have calmer waters and if you end up capsizing, you will have a short swim to land, and your gear will be easier to recover too. Bring a map and compass with you as navigating can be difficult and you risk extending your trip by a lot in both time, distance and energy otherwise. Remember to look back regularly so you know what things will look like on the return trip. This is especially important to find crossings between lakes. Try to remember landmarks. Learn the J-Stroke. This means you paddle normally with flat blade until you start pushing the top hand and handle down. You then twist the top hand with the thumb down so the angle of the blade changes, pushing somewhat out from the side you are paddling on, meaning it will compensate for the twisting caused by the first half of the stroke, correcting your steering. You can also leave the blade in the water behind you, like a steering oar/rudder for good control. This way you don’t have to shift sides constantly. It is similar to the J-stroke, only at the end of the stroke you let the paddle rest in the water for a few seconds, using it to control your direction by causing some drag to either side. Think of a traditional Venetian gondola. The further out to the side you stick your paddle, the more the canoe will try to twist to one side. Therefore try to paddle close to the side of the canoe, but try to avoid slamming the paddle into the canoe as that will ruin any chance of spotting wildlife. Lean forward and pull back with your torso, not just your arms, as you paddle. That way you get a longer strike and use less power from your arms. Think of cross-country skiing. No one stands straight up and uses only the arms to push with the ski poles. You have to lean forward and use your torso for best result, or else your strokes will be shortened and energy draining. Maintain a triangular shape with straight arms for the first half of the movement, and only bend your rear arm for the last bit. Paddling crosswind or stronger headwind can be difficult as the wind will try to twist your canoe around if you are alone. If you have to paddle crosswind, then aim your bow slightly to the side of where you want to go. The wind will cause you to drift even if you paddle perfectly straight. Paddle on the opposite side of the wind. You don’t have to use the J-stroke as frequently, if at all, as the wind already compensates for the twisting. If you just can’t counter the wind and get the bow into proper direction again, then just let the wind do its job and let it pull you around fully, then switch seats, paddling from the former bow, now new stern. 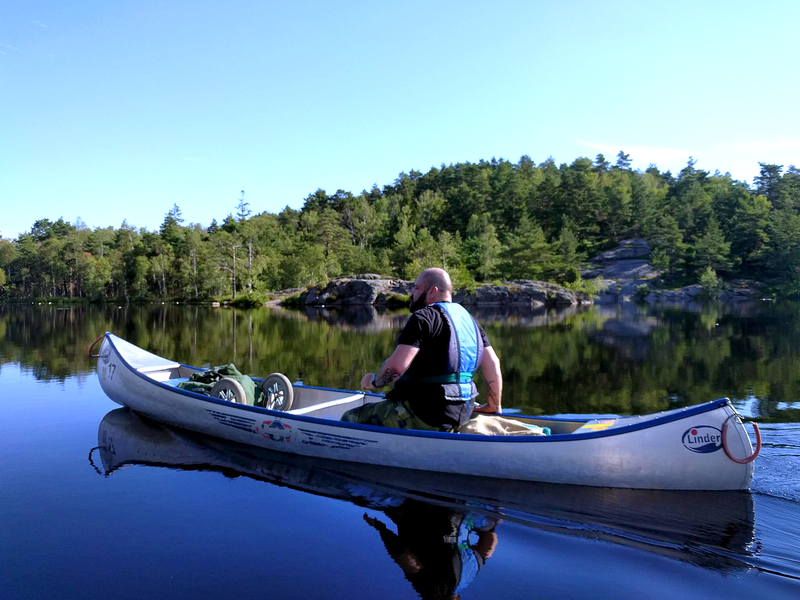 Sitting more centrally gives you more control if you are alone, as weight is centred, thus causing the canoe to pivot around the centre instead of the stern. Also look at the waves and try to find calm waters with shelter from the wind. It might be a bit longer to paddle, but it will be a lot easier. If you need to turn around, then large, horizontal semi-circular strokes, centered around the middle of the canoe, pulling first in front of the centre and finishing at the back of the centre are good. That way the canoe stays more in place. Or vice versa with reversed strokes, of course. Regular reversed strokes can of course also be used to quicker readjust your heading, as can sticking out the paddle at an angle as far to the opposite front side as possible, when seated near the centre. Tilting the canoe by sitting more to the side can also help you turn around quicker, but is best for calm waters without wind. If you are alone and have a cart to pull/push it over land with, then flipping the canoe to stand on the side makes it easy to get the canoe onto the cart. The straps are easy to slip underneath the stern and bow sides as the sides are curved. It is often easier to push the canoe rather than dragging it behind you. Same thing when going downhill. Criss-crossing down steeper hills might be easier, but also be aware that it might topple over if the angle is too steep. Likewise uneven ground, large stones, tree roots and deep tire tracks can cause it to topple. Go slow and safe. If you don’t have a cart then you can also carry it on your shoulders. Here is a good video that shows how to lift it. This is simply a complete no-no. Make sure to store your paddle safely as recovering it if you have lost it will be extremely difficult if you are alone. Having an extra with you might be a good idea. Flip it from the end. Reach over and pull rather than push. It will be almost completely water-filled, making it more difficult to get into. Flip it from the side using the centre bar. Lift the nearest side and grab the centre of the bar with one hand and let the other “walk” down to the other side as you pull and lift as much as possible. Get in again by pulling yourself up holding the seat or bars, facing the end with your legs towards the middle, one leg at a time. Turn around and scoop out the water, trying to maintain stability as you do so. If you are two, then the other person can hold down the opposite side of the canoe as you get in. You in turn counter-balance, leaning out over the side as your partner gets in. That’s it. None of this, except for the recovery is particularly difficult and can be learned in a couple of hours. And remember to always wear a floating vest. Without exception.